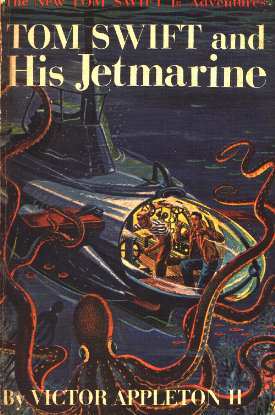 The Jetmarine, the second great invention of Tom Swift Jr., takes the young inventor into a desperate battle with bold modern pirates who have been ravaging the sea lanes off our southern coast. The atom-powered, two-man submarine is launched just in time for Tom and his pal Bud to set out to rescue Tom's father, who has fallen into the hands of the pirates. The wily enemy pulls no punches in trying to wreck the amazing Jetmarine that outspeeds any sub and is able to plunge miles to the ocean floor. Breathtaking running battles through hurricanes and gunfire, thrilling struggles with undersea monsters, imprisonment and escape from the pirate stronghold are part of the excitement of this second book in the new TOM SWIFT JR. series. From the moment Tom innocently picks up a strange coin imprinted with the head of a dog, things begin happening -- not only to Tom, but also to his father, his uncle, to Bud Barclay, and Chow the cook. The pace continues from the Swift plant at Shopton to the Caribbean -- on and under the sea, in the air and inside the pirates' secret hideout. The main invention in this book is, of course, the Jetmarine. The Jetmarine, which is Tom Swift's second major invention, is the first in a long line of Tom Swift atom-powered submarines. 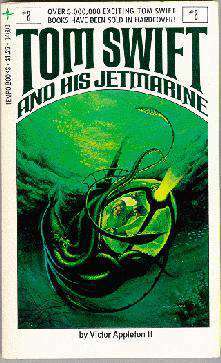 Tom built the Jetmarine mainly for underwater exploration, but in other books it mentions using Jetmarines to ferry cargo (which, actually, is an interesting idea). How does the Jetmarine work? The basic principles behind the Jetmarine are the same as for any other submarine ever invented. The Jetmarine is basically a hollow steel shell that's just light enough to float on water. Weighed down with ballast, the sub sinks; drop the ballast and the sub rises to the surface. Once underneath the water, propellers (or in this case, jets of water) steer the ship. It should be pointed out, however, that Tom's Jetmarine has a design flaw. See that big transparent nose on the front of the ship? Well, despite the fact that the material used in that nose is stronger than steel, the nose still presents an overall weakness in the ship. Designers have found out that it's best to have a ship made out of one material -- having two substances joined together like that creates a potential hazard at that joint. Besides, why have a huge glass nose in the first place? You donít need something that large just to have a good view, and no one steers by sight underwater -- not only is it too dark, it's plain safer to use sonar. "Tell me more about this latest invention of yours, Tom. I'd like to get the full pitch on the Jetmarine and help you try it out, since we'll have to wait a while for our rocket trip into space." Tom's two-man submarine was to be manufactured and sold eventually as a speed craft for safe ocean travel, especially to distant points such as Africa and Australia. This type of travel would avoid the delays sometimes experienced by surface ships and aircraft during bad weather. The submarine was to operate on an entirely different principal of propulsion from the standard propeller type. A stream of water forced through special tubes under great pressure would be its means of propulsion. "A hydraulic jet," Tom explained. "Give it to me in first-grade science," Bud begged. Tom laughed. "Remember when we were kids and filled balloons with water, then let go of them? Same kind of propulsion." "But all I got was a soaking!" Bud remarked. "Go ahead, professor." The young inventor explained further that the submarine had an atomic pile containing Swiftonium, the radioactive isotope that the Swifts had discovered in South America. In order to protect the occupants of the Jetmarine from the deadly radiation, the whole power plan had been encased in a three-inch thickness of Tomasite. This was a strong, durable plastic named after the young inventor and his father. Heat resistant, it absorbed gamma rays much more efficiently than lead shields, which are ordinarily used. "Sounds terrific," Bud reflected. "Go on." Tom said that the submarine, except for its transparent nose, was double-hulled." "As I see it," Bud interrupted, "The construction of this sub is just like sticking a cigar into one end of an egg and leaving a little of it protruding." "Right. Only the part of the cigar that you can see is as clear as glass," Tom replied. The nose is molded of transparent Tomasite." The outer hull was also painted with Tomasite, to prevent reflection of sound waves. Thus, sonar devices could not detect the Jetmarine. "This is wonderful, genius boy," said Bud, grinning. "But you still haven't told me why makes the Jetmarine go." Tom laughed. "I haven't? Well, The intense heat from the atomic pile will create steam to drive a turbine, which in turn will activate a pump. This will force out a jet of seawater so fast that it will cause propulsion. "One thing at a time, skipper," Bud pleaded, "Just how do you control the speed?" "It's regulated by a battery of cadmium rods. They control the rate of fission when they're inserted or withdrawn from the atomic pile. The deeper the rods are inserted into the pile, the less the heat energy. The more the rods are withdrawn, the faster we generate power. What about the Fat Man suits? Tom Swift's father wanted Tom to invent a way to escape from the Jetmarine in case something went wrong. Tom Swift complied by creating his Fat Man suits, which he uses over and over and over again in other books. Basically, the Fat Man suits were just like miniature, one-man submarines, except they were equipped with arms and legs to enable great maneuverability and dexterity. (For a picture, see the cover of Tom Swift and his Deep-Sea Hydrodome) These miniature subs were completely equipped: they had a recyclable oxygen supply, a propulsion system, and a ballast system. Tom got a great deal of use out of these creatures, mainly for retrieving underwater objects or underwater construction. Tom smiled. "I've been working on that as a secret project. Bud has dubbed the suit the Fat Man." Tom briefly outlined the principal features of the metal Fat Man. The body of it was egg-shaped and was five feet in diameter at the center. Inside an operator's seat had been build, surrounded by a number of instruments. There was also a quartz vision plate. This window would serve as entrance to the Fat Man. Tom pointed out that the suit was propelled by air pressure and was equipped with small ballast tanks, which would enable it to be manipulated like a tiny submarine. Two such Fat Men were to be installed in the Jetmarine next to the decompression chamber, which had been designed to be opened either from the inside or the outside. Mr. Swift listened intently as Tom continued, "But my main innovation, Dad, consists of the Fat Man's pantograph arms and legs. Hands and feet, too. I work them on button controls from inside. They're almost human." The elder inventor raised his eyebrows. "How do you keep this gimmick from falling over?" "Gyroscope!" Tom replied. "An automatic balancing brain." "The lithium hydroxide," said Baker, "is taking care of what the boys are exhaling. And that excellent gadget by which Tom is getting oxygen from the water is a great invention, harder to perfect than the sub itself. If anything should happen to the Jetmarine, they would be able to live in the suits a long time." "Tom, there's not a sign of corrosion on the inside of that test jet engine you've had in the salt-water bath," he said. "That osmiridium you sprayed on the pipes did the trick. Someday let me know just how much osmium and how much iridium you used in the formula, will you?" Tom was thrilled. Now he could keep the hydraulic jet engines of the submarine working indefinitely without the danger of corrosion from seawater. The young inventor had worked hard on this problem. He knew that even stainless-steel pipes would not hold up; that paint could not withstand the intense heat; and that rubber would insulate the seawater from the nuclear reactor and prevent good heat transference. After figuring out the alloy osmiridium, Tom had distilled it into the Jetmarine by a super-high vacuum so that every exposed surface of the machinery was protected. Basically, though, the dream behind the Jetmarine -- being able to easily and comfortably cruise deep beneath the sea -- has yet to appear. The reason for this is quite simple: pressure. It's currently impossible to build a large, comfortable sub that can dive miles beneath the sea -- even if we used the best materials out there today the sub would still be smashed flat. It's not that the task is impossible, though. Scientists are constantly designing better materials, harder alloys, and stronger construction techniques. One day a true Jetmarine will be built -- but it won't be soon. How much impact would a Jetmarine have on civilization? A true Jetmarine, capable of diving miles beneath the sea, would definitely find at least a few buyers. Oceanographers would probably love to get their hands on a true deep-sea submarine. The military would like to have some too, I'll bet. It's the materials and techniques used to build the Jetmarine, however, that will find the biggest market. Any alloy suitable for undersea travel would probably be very useful in other high-stress environments (i.e. space travel, aircraft, drilling), and any really strong alloy can always be put to good use. The construction techniques, if adapted, could also be used in developing undersea oil rigs and deep-sea mines -- and thus finally give us a way to tap the large mineral reserves located deep beneath the sea and just out of our reach. I must say, however, that Tom's main reason for building the Jetmarine (that is, using it to transport passengers) just doesn't hold water. Maybe back in the 50's transatlantic transportation was a problem, but it sure isn't anymore. Even if storms were still a problem (which they aren't -- modern planes can just fly above the storm) submarines are just too slow to be used for ocean travel. Speed is the buzzword of the day, and, frankly, the Jetmarine doesn't have it. Lastly, I'd like to mention three other things mentioned in the book that I don't have time to cover in detail: the blackout ray, the remote control car, and the rescuing of Tom Swift's Jetmarine. In the book, the bad guys invented an amazing machine that could generate rays that were capable of knocking people out cold for some time. The enemies installed this ray on an aircraft and used it to loot ships and cargo (and Tom Swift, of course, had to create an antidote). Now, I won't go into the possibilities of creating such a knockout ray, but I did want to point out the tremendous fallacy in Tom Swift's anti-ray. In the book, when Tom Swift heard about the attacks, he remembered the "pulsator" (on which, curiously, no details were given) he was working on for the government. Tom recalled that he could create a ray that would jam his pulsator, so he decided to mount this machine on the Jetmarine to see if it could stop the enemy pirates. Finally, in the book, Tom Swift's Jetmarine is rescued by a device his father had created many years ago -- a Giant Magnet, or Electromagnet. The story behind this invention can be read in the book Tom Swift and his Giant Magnet. It's neat, I think, that the book explicitly comes out and says that the Giant Magnet Tom used was invented by his Father. It's kind of a nice touch.